During your Vietnam cycling tours, let’s spend time visiting Hanoi by bike and explore this charming city at your own pace. You will have chance to experience one of the oldest streets in the Old Quarter; enjoy stunning views of the breathtaking Hoan Kiem lake; and take in the vibes of an authentic Vietnamese marketplace. Your bike awaits you! As a day dawns, the city is overwhelmed with light morning mist; the pure atmosphere is likely to recover the equilibrium in your soul. It’s time to visit Hanoi by bike. There is no better way than immersing yourself in the alluring atmosphere; that you’ll only experience in the morning lull of vibrant Hanoi. This fast-paced city has a truly unique and serene feel as it awakes each morning. Just get on your bike, start your Vietnam cycling tours by riding around Hoan Kiem Lake to fill your heart with the unique, fresh vibes! The lively morning rhythm of life here may leave you with strong impression to rejuvenate and refresh yourself for the day ahead. 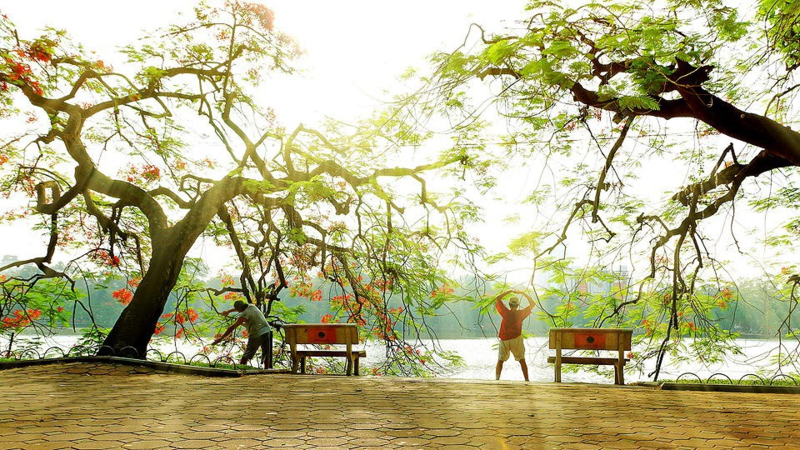 Some Hanoi ladies practice their morning Tai Chi and aerobics around the beautiful Hoan Kiem Lake. The men huddle together playing Chinese chess and gossiping. The innocent children in their pure white blouse are going to school accompanied by their parents. Everything is getting ready to start a nice day in the capital of thousand years of civilization! 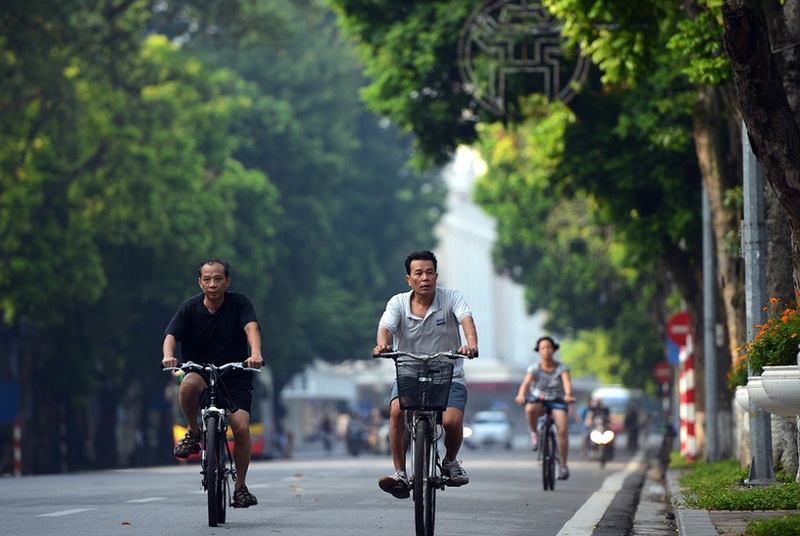 Don’t forget one of the great highlights of your Hanoi cycling tour. It is exploring the beating heart of Hanoi, the Old Quarter, also known as 36 Streets. It is a close-knit community of people living in towering rows of houses, packed close together along narrow lanes. 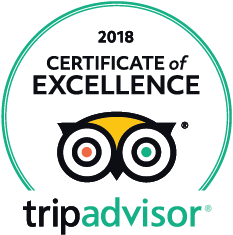 This is a fascinating place to get lost and soak in the sights, smells and sounds of a bustling Asian capital; that is partly modern and partly historic. It isn’t hard to imagine Hanoi in the past while riding in the warren of small streets and tiny alleyways; that make up the Old Quarter. During visiting Hanoi by bike, you’ll marvel at the romantic flower market. It is where you’ll see the lively haggling between customers and vendors as well as the variety of fresh flowers on offer. Tiny mom-and-pop shops and a never-ending procession of street vendors sell everything from fruits and vegetables to shoes, brooms, etc. 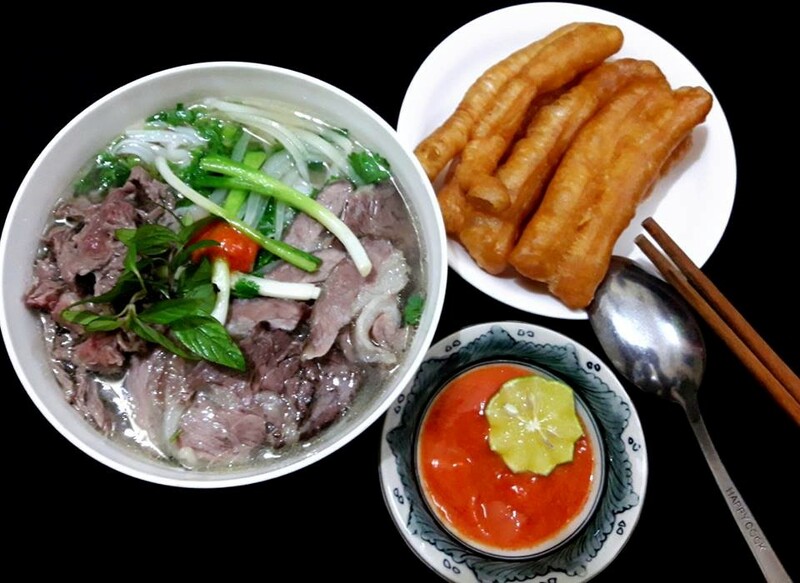 After a refreshing ride, savor your active morning with a delicious bowl of “pho” as one of local experiences in Hanoi. It is the traditional breakfast noodle soup and quite possibly your new breakfast favorite. It is such a perfect example of the country’s adherence to the concept of balancing the five flavors: salty, sweet, sour, bitter and hot. The spicy broth is delicious, with strips of succulent beef and chewy rice noodles ideal for hearty slurping. You’ll sit back and reflect on your unforgettable morning over a strong authentic Vietnamese coffee or tea. 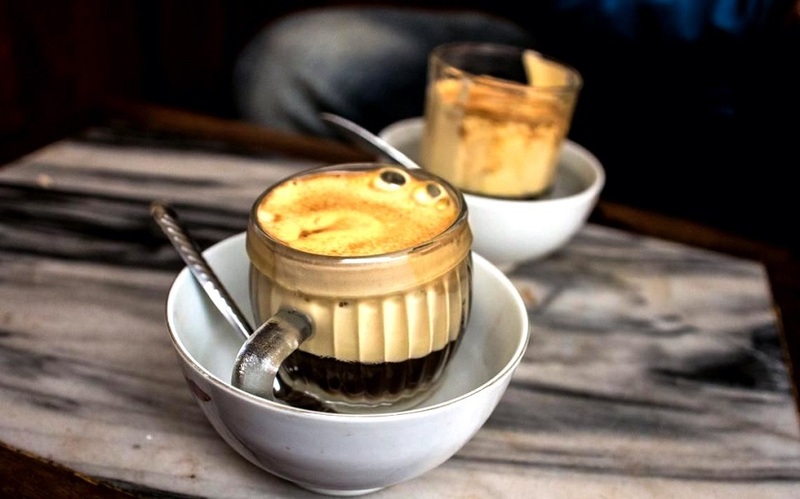 It is worth trying egg coffee prepared with egg yolks, sugar, condensed milk and robusta coffee at famous Giang Cafe. Hanoi is the political hub of the country, as well as the cultural and historical center. Founded more than 1,000 years ago, with the length of living, the city remains steeped in tradition. There are a number of unique architecture, fascinating historical sites that filled with traditional spiritual values to get by. 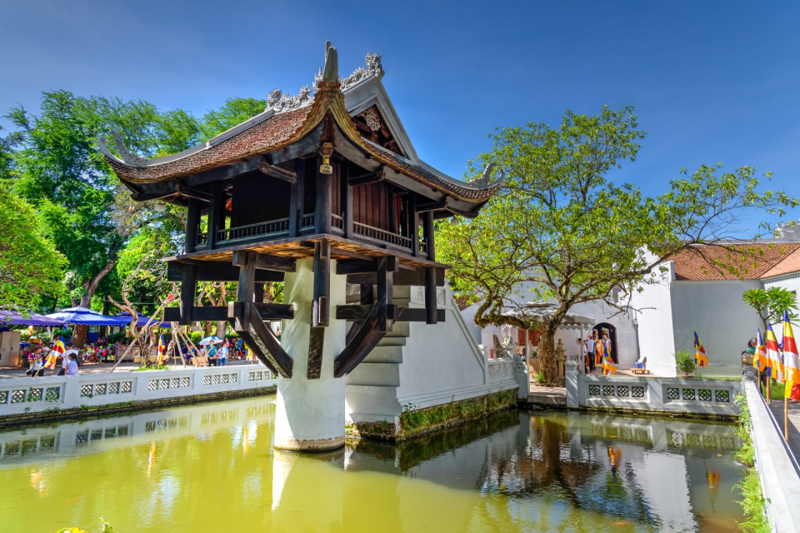 Mentioning about Hanoi, what comes first to visitors’ mind is the 1000-year-old temple to education and site of the country’s oldest university – Van Mieu – Quoc Tu Giam (The Temple of Literature). It explains why this destination is mostly included in Hanoi city tour of Vietnam itinerary 2 weeks. 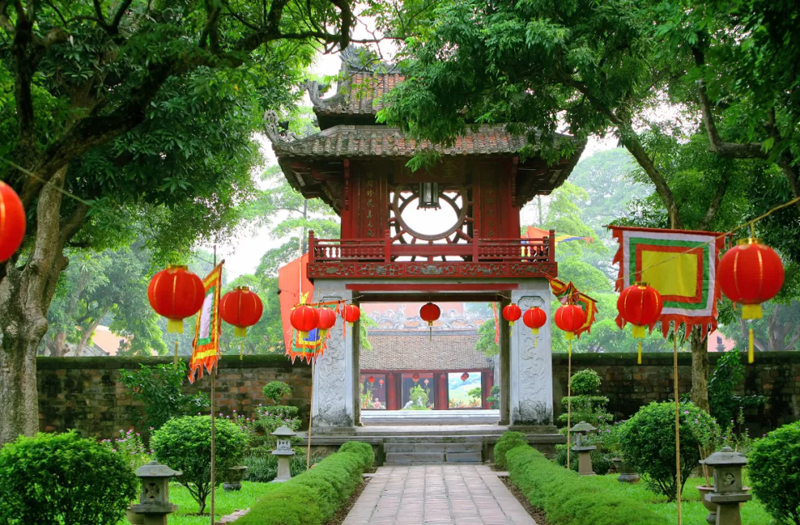 Besides its foremost meaning, Van Mieu is also the place to worship Confucius, setting doctor steles. Youngsters and youth always come here to pray for success before any examinations. There are some other destinations that are worth to your Vietnam cycling tours in the afternoon besides Van Mieu. It is Museum of Ethnology which displays a variety of cultural items from Vietnam’s numerous ethnic minorities, or Ho Chi Minh’s Mausoleum, One – Pillar Pagoda, Imperial City of Thang Long where was a residence and workplace for the kings and royal families during the period of five dynasties; Hoa Lo Prison – a hell-hole of a prison built by the French in the 1880s and maintained till the end of the Vietnam War. 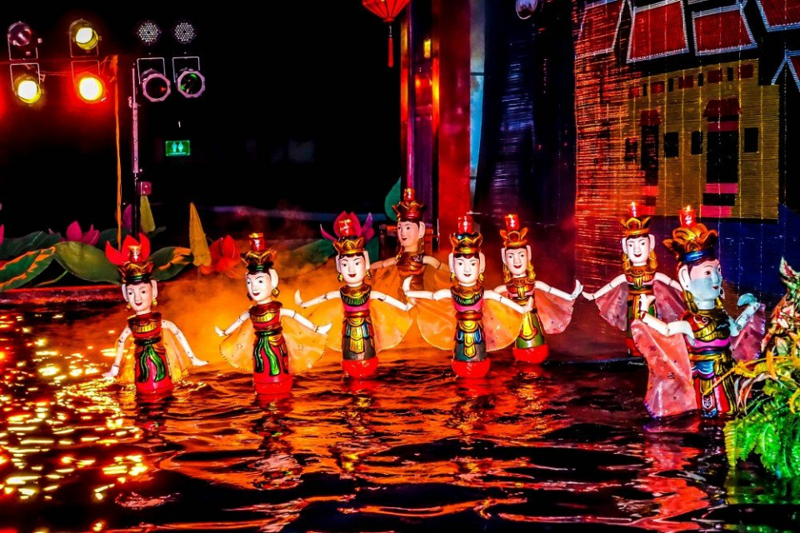 There is never a dull moment in Hanoi, especially at night. This vibrant city is teeming with fun activities once the sun has set. The Old Quarter is where night owls head to. Street food & drink vendors, live music, discos, clubs and bars as well as decent karaoke joints are the norm here. 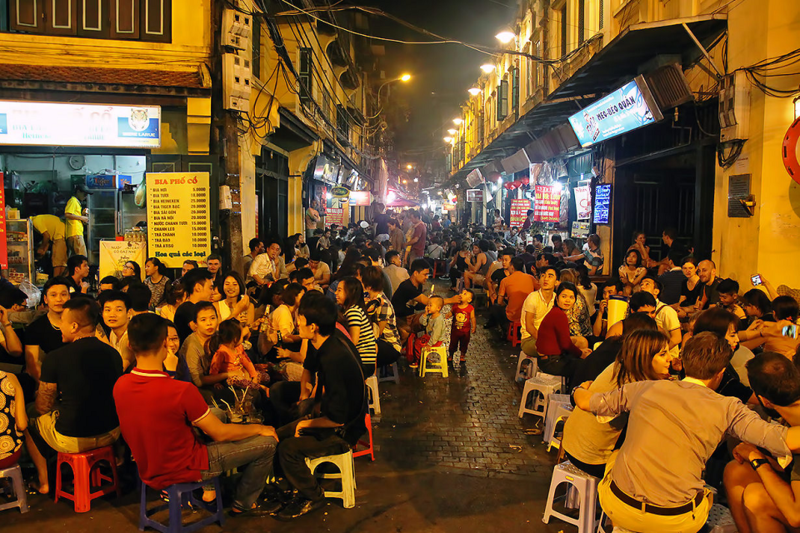 Especially, a must-visit for any first-time visitor to Hanoi is Bia Hoi Junction which is widely-regarded as the quintessential nightlife spot in Hanoi. This junction in Ta Hien and Luong Ngoc Quyen street, Old Quarter (North of Hoan Kiem Lake) is the absolute classic night time activity in Hanoi. Several shop-houses have plastic stools spilling out onto the streets, with beer price as little as VND10,000 (less than US$1) and street vendors serving steamed peanuts, beef jerky and other exotic snacks. The other choice is riding to The Vietnam Central Circus which is ideal for a day of family-friendly fun. It is where travelers can enjoy, live performances and simple fairground games within a large park in the south of the city. Located at 67 Tran Nhan Tong Street, next to Thien Quang Lake, it opens on Tuesday to Sunday at 20.00 pm – 22.00 pm. 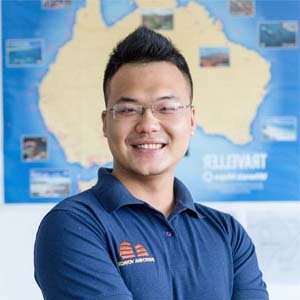 Those 5 reasons above might not be everything; but they are for sure one of the best highlights in your Vietnam cycling tours. It is simply to book the best bicycle tours in Hanoi and let your travel consultants do the rest for you.